Learning how to jumpstart a car is one of the most basic – and important – skills you can possess as driver. Just like managing your tire pressure, learning this skill is something you’ll inevitably need to know to avoid getting stranded. This simple knowledge can pull you out of some sticky situations and can help out your friends, neighbours and the folks you pull over to help on the side of the road. It’s the simple skill of transferring power from one source of energy to another, seemingly sharing power to offset the drain on your own car’s battery. Without knowing how to jump start a car, you run the risk of having to pay for costly roadside services, tow-trucks – and lastly, sitting idly for hours on end until someone comes to rescue you. Let’s imagine you’ve had a hectic day at work; you make it to the grocery store to pick up some grub for dinner before filling up the car with gas and rushing home to see your family. Upon turning the key off in the ignition and heading inside, you grab your dinner and your phone, only to leave the car door slightly open – but it’s daylight outside – you don’t see the light is on. Overnight, the car’s battery runs out of juice. First thing in the morning, you wake up late. You’re rushing out the door so you can make it to work on time when… nothing. The car won’t turn on. In this post, we’ll outline the simple steps you’ll need to follow to properly jump start your car. The first step in learning how to jumstart a car is getting the necessary equipment. Jumper cables are required to jump start your car. It’s always a good idea to keep a set in the trunk or hatch of your car just in case. You never know when you’ll need them. Some vehicles come with these, or you can ask your local dealership for more information when purchasing your vehicle. You’ll also need another vehicle that has power to complete the jump start. Your dead battery vehicle will be borrowing power from the car with the good battery. Line them up bumper to bumper so you have the right amount of slack to reach both battery terminals with the cable. Leave the vehicles off until all the cables are fully connected. This is the most critical step involved in a jump start that you’ll need to know. You must get the terminals correct. Place a RED jumper cable clip to the POSITIVE (+) battery terminal. The BLACK clip will be connected to the NEGATIVE (-) terminal. If your battery doesn’t have + or – symbols on the terminals, always remember that the larger terminal is the positive terminal. When in doubt, refer to your user manual and ask your local dealership for further help. Let it run for about one minute with your dead battery vehicle still in park. Turn your vehicle’s ignition to AC power to accept the charge from the working vehicle. After about one minute, try to turn your car on. If your vehicle doesn’t start it may mean that your battery can’t be helped, and you’ll require a replacement or maintenance with a local dealership. Disconnect the negative cables first. Once you’ve removed one cable, the circuit will be broken and the power transfer will be stopped. When the jump start works, close your hood and drive the car for about 15 minutes without turning it off. This will recharge the battery. If you go back to the car at the end of the day and it won’t turn on again, this means that your existing battery will not hold a charge and will need to be replaced. 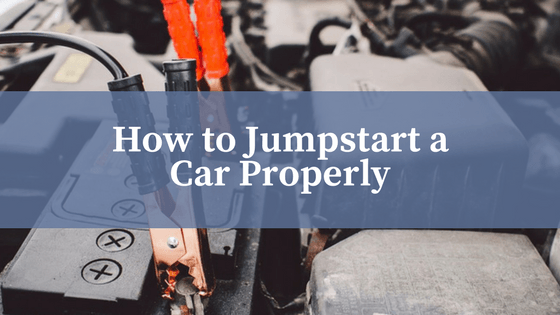 Jump starting your car is a simple skill to possess that can save you from missing or being late for appointments, work, or just getting home at the end of the day. As always, you should consult the owner’s manual of your vehicle before attempting anything under the hood.